Tiger Zinda Hai: Salman Khan And Katrina Kaif Troll Each Other On A Reality Dance Show! 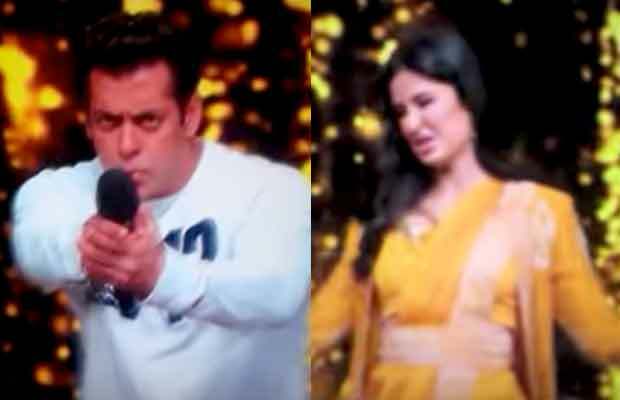 Tiger Zinda Hai stars Salman Khan and Katrina Kaif troll each other on a reality dance show! Salman Khan and Katrina Kaif are one of the most bankable couples of Bollywood. Their on-screen and off-screen is chemistry is sizzling. But their friendship is more attractive! Whenever Salman and Katrina are together we can see the sweet bond between them! The stage of reality dance show ‘Dance India Dance’ was no different! Salman Khan and Katrina Kaif were promoting their upcoming action-drama flick ‘Tiger Zinda Hai’. Tiger Khan and Tigress Kaif were acting as celebrity judges on the show. In between performances, the hosts took advantage of their funny bones called their celebrity judges on the stage. The co-stars were asked to imitate each other’s behaviour on the sets of ‘Tiger Zinda Hai’. Salman kept trolling Katrina’s poker face. He even went further and prompted Mithun Chakraborty to say it’s too much. Not wanting her co-star to have all the fun, Katrina too imitated Salman. She trolled Salman’s nonchalant attitude on the sets. But Katrina went one step further and danced to Salman’s famous ‘O O Jaane Jaana’. Later Salman too grooved on Katrina’s ‘Chikni Chameli’ at the instance of the hosts. Salman and Katrina together grooved on ‘Swag Se Swagat’ along with other contestants. We also saw Salman Khan and Mithun Chakraborty riding tiny toy horses. But the madness intensified when Salman asked Mithun to go down a slide with him! Salman sat ahead of Mithun and laughed their way down the slide. All this while Katrina, other judges and contestants burst out laughing! Ali Abbas Zafar directed ‘Tiger Zinda Hai’ will narrate the story of Tiger a.k.a Avinash Singh Rathore and Zoya. The two will go on a quest to save Indian nurses from the captivity of International terrorist Abu Usman played by Sajjad Delafrooz. Yash Raj Films’ produced movie is set for its Christmas release on December 22nd, 2017. Previous article52-Year-Old Milind Soman All Set To Marry His 26-Year-Old Girlfriend Ankita Konwar?